These boundaries set by Art Deco involve primarily the use of platinum and white gold, vivid coloured stones, geometric shapes and repetitive patterns. Round stones were not popular as they are now, with geometric shapes like the trapeze, triangle and half-moon evident in pieces created during this era. The use of dramatic colours signifies a change from the previous art movements before Art Deco, which predominantly used pastel tones and is also juxtaposed by the exclusive use of colourless stones in the Edwardian era. Therefore, using bold and contrasting stones and enamels are possibly the most iconic aspects of Art Deco jewellery. 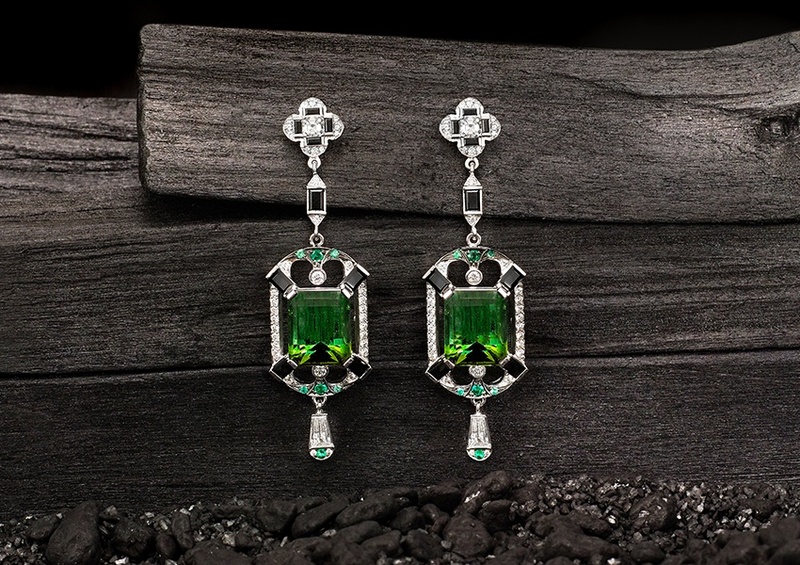 We have been inspired by the incredibly bold style of this era and in line with recent trends, developed sensational chandelier earrings featuring White diamonds, Green Tourmalines, Black Spinel and Emeralds in a dazzling combination of contrasting round, baguette, emerald and cushion cut stones. Moreover, chandelier earrings tend to be flattering for most face shapes, particularly since they tend to be geometric and long, which is great for balancing against the shape of the face. For example, those with round faces should choose slim and long chandelier styles, which will help to create an illusion of lengthening the face, whilst a heart shape face should choose earrings with wider bottoms to balance the dimensions. These bold earrings can also compliment a bridal look, as well as off the shoulder cuts, as they adorn the empty space above the clavicles. If you’d prefer a more subtle colour palette, we have created an equally exquisite pair of white diamond and pink morganite chandelier earrings, in an elongated teardrop shape, patterned by kite, round and cushion cut stones. Both of these Art Deco inspired pieces are monumental in representing the most influential movement in art history. Interested in trying these stunning pieces on? Contact us today to make an appointment.